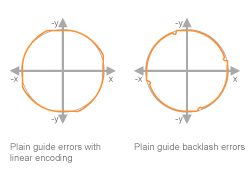 In contrast to plain guides and plain bearings, hydrostatic guides are permanently play-free. The friction of hydrostatic guides is a power of ten lower and proportional to the speed. 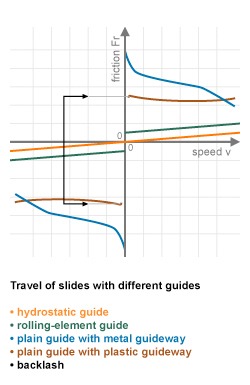 In contrast to plain guides, hydrostatic systems do not suffer from backlash when the direction of motion is reversed or the stick-slip effect.